617 Squadron, RAF, “The Dambusters” was a single squadron formed during the Second World War to carry out a single special and dangerous task. That operation “Chastise” has since become a legend in the annals of military history and it possess all the traditionally admired military attributes of originality, surprise and heroism coupled with a very dramatic outcome. Operation Chastise has in many ways overshadowed the later exploits of the men who formed the squadron. Over the last few years some people have questioned the actions of Bomber Command and the actions taken to destroy the industrial and domestic centres of Germany during the Second World War. I myself, have taken a sideline to this question. I do not condone or sanction what Bomber Command did in its attempt to destroy the industry of Germany. I believe that the most dangerous thing on this planet is man, as soon as people start to attack each other, the animal instinct takes over. Each will try to outwit or kill one another singly or in bulk should the chance arise. To this end any aspect of war is bad. People can pass comment on certain aspects of all wars but I do not believe it is right to criticise someone or something that they were not involved in or with. Modern information technology has made vast amounts of statistical and anecdotal evidence available to the historian but what sometimes gets lost in this mass of information is the immediacy and emotion caused by the raw fear of warfare. Normal reactions to events judged sitting in the arm chair by the fire side are not the same as those as when ones life and existence is tangibly at risk. 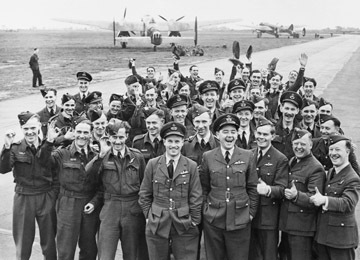 This website is a tribute to the personnel of and people associated 617 Squadron, “The Dambusters” primarily during the war years. It also serves as a tribute to all those of Bomber Command from whom the members of 617 Squadron were drawn, who served, fought, suffered or died during the Second World War. Please sign our guestbook before you leave the Dambusters site.